You can connect a variety of signals to the Rockville RSM15A, making it a very flexible speaker. Use multiples of them for your main monitor system. Use it a keyboard amplifier. Or pole-mount them and use them as your main speakers. With 1400 watts of peak power there is enough power to use the Rockville RSM15A for all your needs. A built-in adjustable feedback filter to help squash annoying feedback that can creep up when using mics in close proximity to a monitor. Get the monitor coverage you need with the Rockville RSM15A! A mic/line input gives you the flexibility of plugging in a mixer signal, microphone, or keyboard. 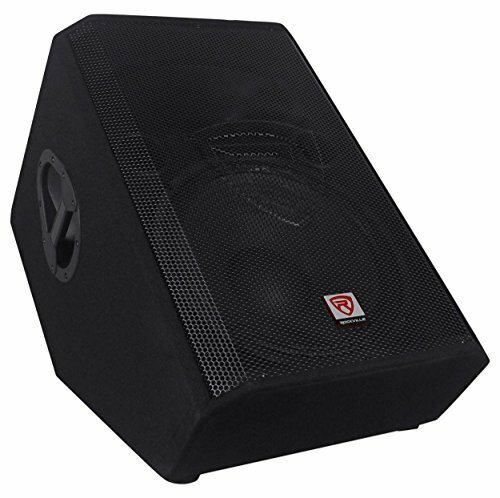 Rockville RSM15A 15" 1400 Watt 2-Way Powered Active Stage Floor Monitor Speaker. 350 Watt RMS / 700 Watts Program Power / 1400 Watts Peak. High power 15" woofer with 3" KSV voice coil provides incredibly deep bass and acoustic power. A microphone/line selectable input gives you the flexibility of plugging in a mixer signal, microphone, keyboard, or your guitar. LINK OUT connection via combo balanced XLR - 1/4" TRS preamp output for multi speaker setup. Frequency Response: 45Hz-20KHz. Maximum SPL @1w/1m: 96dB peak. High-power 2-way pro sound stage monitor speaker system for live sound and playback applications. Wedge shaped enclosure provides the perfect angle for stage monitoring use. Compact and light weight system delivers distortion free sound even at extreme SPL. Great power to weight ratio. Linear Class AB amplifier technology: high power, transparent sonic performance. Internal switch-mode power supply for low distortion audio with superior transient response. State-of-the-art 1.75" titanium diaphragm compression horn driver for crystal clear high frequency reproduction. Ultra-wide dispersion, large-format Elliptical wave guide horn. Custom Molded Steel Grill. Ergonomically shaped handle for easy carrying and setup. Aviation Grade Black Carpet. Rubber Isolating Feet. Mic / Line level control. Built-In 3 band Equalizer allows you to control High, Mid, and Low frequencies to attain your preferred sound . 300Hz to 5KHz Feedback frequency filter. Adjustable feedback filter. Balanced ultra-low noise Mic / Line input via combo XLR & 1/4" TRS jack. Balanced line output via combo XLR & 1/4" TRS jack. Amplifier clip limit LED indicator & power LED indicator. Impedance: 4 Ohm. 115 / 230 Volt switchable power supply with external user serviceable fuse. Dimensions: 18.6" x 15.5" x 25.3" (L x W x H).